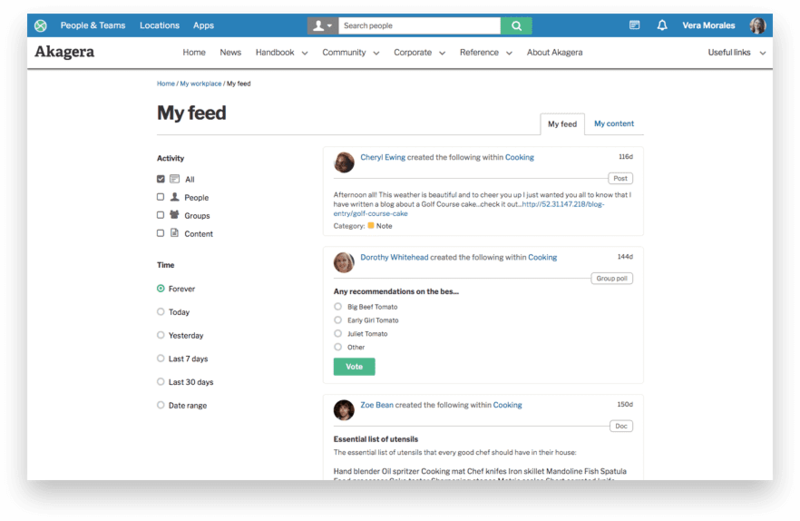 Invotra Feed ensures users can keep up to date with communications and stay on top of all of the many social interactions that take place in every working day. Making you aware of the updates and activities happening in the groups you are a member of, and allowing you to keep track of all important colleagues and content, be reassured Invotra feed notification makes sure you haven’t missed, or forgotten, any important developments. Updated at regular intervals, feed messages are available through a My feed icon on the main navigation bar or under My feed within My workplace, an area where all interactions and content can be located in easy to use categories. Users can organise feed notification by time and by activity and all feed messages are stored forever, for future reference. 1. When a piece of content is created and published by someone you follow or in a group you are a member of. 2. If a piece of content is updated by someone you follow or in a group you are a member. 3. When a user you follow joins a group or a group you are a member of gets a new member. 4. Whenever a user you follow updates their profile.When a user you follow joins a group or a group you are a member of gets a new member. 5. Each time a comment is added to a piece of content you follow or by someone you follow.